00:20:00 Makes 4 servings, 1/2 cup (125 mL) each. Makes 4 servings, 1/2 cup (125 mL) each. This traditional dish, born in the palaces of India, gets a flavour boost from MIRACLE WHIP Dressing. Mix first 3 ingredients until well blended; set aside. Heat oil in large nonstick skillet on medium-high heat. Add onions, garlic and ginger; cook and stir 2 min. or until onions are crisp-tender. Add paneer and seasonings; cook and stir 2 min. or until paneer is lightly browned. Add tomato mixture; cook on medium heat 5 min. or until heated through, stirring occasionally. Stir in lemon juice. Add 1/2 cup frozen peas or other frozen vegetables to paneer mixture with tomato mixture. Serve with hot cooked basmati rice or naan. 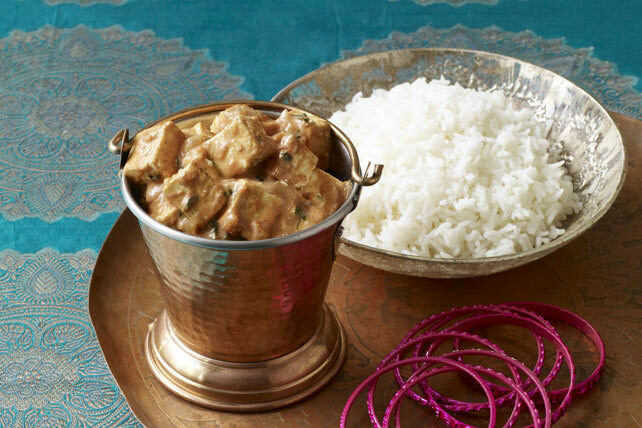 Serve with Calcutta Chicken Koftas. Serving Size Makes 4 servings, 1/2 cup (125 mL) each.